18-year-old right-hander Shohei Otani, a Japanese high school star, is pursuing a career in Major League Baseball instead of playing professionally in Japan. He was selected in the first round of this week’s amateur draft by the Nippon-Ham Fighters (NPB), but still wants to play in the United States. "I think I will start in the minor leagues but I want to challenge in the majors. It's been my dream since entering high school," said Otani according to a report by the Associated Press. The tall right-hander who touches 99 and 100 MPH with his fastball has been scouted heavily by Major League Teams including the Boston Red Sox, Baltimore Orioles and Los Angeles Dodgers. The Nippon-Ham Fighters now have until March 31 to reach an agreement with Otani. There is no rule preventing MLB organizations to talk to him as well in this period, but there is a gentlemen’s agreement between Major League Baseball and Nippon Professional Baseball to stand aside. 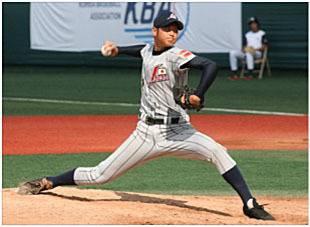 Otani played for Japan at the XXV IBAF 18U Baseball World Championship in Seoul, Korea this summer. His teammate and fellow High School star Shintaro Fujinami was selected by the Hanshin Tigers in the first round of the draft. Led by these two hard-throwing pitching prospects Japan finished in sixth place in Seoul. The United States won the tournament defeating Canada in the Gold Medal Game.